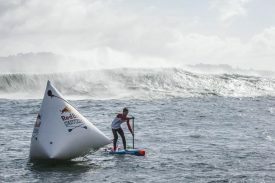 San Francisco, Calif. (July 31, 2018) – Red Bull Heavy Water, quite possibly the most intense stand up paddling event in the world, will showcase top performing athletes in the ~12km (7.5 mile) course, with an event window from October 15th – November 2nd and prize money totaling $75,000. The 36 athletes, both male and female, will start from inside San Francisco Bay, paddle under the iconic Golden Gate Bridge, against notoriously challenging weather and water conditions, ending with a three-pronged surf battle and finish at Ocean Beach, as part of the 2018 APP World Tour circuit. 2017 World Champion Connor Baxter (HI) will be taking on the likes of Mo Freitas (HI), 2017 Red Bull Heavy Water winner Casper Steinfath (DK), Lincoln Dews (AUS), Arthur Arutkin (FRA), current World #1 Michael Booth (AUS), Travis Grant (HI), Ryan Funk (USA), James Casey (AUS), Slater Trout (USA), Kody Kerbox (HI), Martin Vitry (FRA), Kenny Kaneko (JP), Leonard Nika (IT), Kai Lenny (HI), Danny Ching (USA), Zane Schweitzer (HI), Riggs Napoleon (HI), Jake Jensen (AUS), Bullet Obra (HI), Christian Anderson (DK), Itzel Delgado (PER) and Enzo Bennett (TAH). Red Bull SUP and water-athlete Izzi Gomez will be pulling out all stops against athletes such as 2017 Overall APP World Champion Fiona Wylde (USA), 2017 APP World Racing Champion Terrene Black (AUS), 2015 World Champion Candice Appleby (USA), Annie Reickert (HI), Chloe Walkerdene (AUS), Andrea Moller (BRA), Manca Notar (SLOV), Shae Foudy (USA), and Nicole Pacelli (BRA). Podium placements will be given to the top three male and top three female finishers. Along with bragging rights, and coveted APP World Tour points, prize money is as follows for both men and women; First Place – $15,000, Second Place – $7,500, Third Place – $5,000, with a grand total of $75,000 in prize money. Red Bull Heavy Water 2018 weather window is from October 15th – November 2nd and a 7-day orange light alert, followed by a 5-day green light alert will signify that optimal conditions are in place for the event to run. Red Bull Heavy Water is held in San Francisco, California and all interested parties can visit redbull.com/heavywater for more information. Looking For Photos & Video?